Simona De Silvestro has completed her first Formula 1 test for Sauber. The 25-year-old Swiss, one of two women drivers employed by F1 teams, completed 180 laps of Ferrari's Fiorano test track in a 2012 car. Sauber test engineer Paul Russell said: "Simona drove very well. Overall, these were two very positive days." 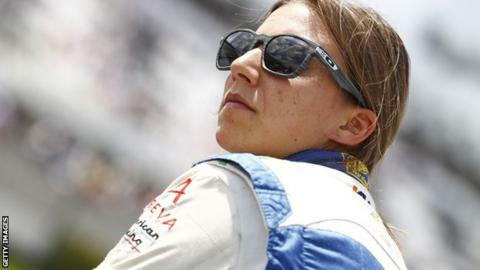 De Silvestro, a former Indycar driver, said: "I already feel confident in the car, which is very positive. I'm quite happy with what I was able to achieve." Writing on Twitter, she added she was "in love" with driving a Formula One car and had "two really great and successful days". The weekend sessions were designed as an acclimatisation test for De Silvestro, who will drive again at Valencia on 25-27 June. Britain's Susie Wolff, Williams's development driver, will take part in a test at Barcelona's Circuit de Catalunya after next month's Spanish Grand Prix before driving in first practice at July's British and German Grands Prix.